Hello readers! How have you been? I’ve been a complete bridezilla for the past couple of weeks- I’m constantly going on Pinterest and looking up dresses! In between sorting out the caterers I was also prepping up for my two day workshop at Doncaster Central Learning Centre and yesterday I finished it with a feeling of happiness! PREP, PREP, PREP. I honestly can’t stress that enough. Have a teaching plan ready and break it down by time so that you know what you’re doing, even if it means cutting down the timings as you’re going. Plan out the breaks and know when you want to have lunch so that you can calculate roughly what time you need to finish. Plan our your activities plus stimuli. I knew what I wanted the participants to do and although I had some clue as to what they knew beforehand, I still differentiated as much as possible. Some of the tasks were group ones as I realised that it’d be easier to get group feedback and discuss. Listen and watch your participants as to how they are and go with the flow! Be positive, smile, have patience. You wouldn’t want someone teaching you to be grumpy, moody or looking uninterested so do think about your presentation. I’m not saying being a completely different person but being professional in a super friendly/laidback manner gets your participants to trust you. Set out the room how you want it. Once you know the numbers you need to think about the layout of the room. Can you easily walk around the room? Do you want the participants to be facing you whilst you’re using the whiteboard and screen? There are loads of factors to think about and of course, you want to make sure that the room is nice and warm so that people aren’t cold. There was tea and refreshments supplied by DCLC so I didn’t have to factor in any of my expenses. Budget. Plan out what you need to print out including your travel costs, I could have gone all out and used loads of fancy paper but at the end of the day you don’t want to end up spending loads of money if you don’t have it. Depending on what your workshop is there are of course loads more points to factor in. Trust your instincts and plan out what you need to well in advance. I broke it down to step by steps so the participants were slowly eased into it. I’m still in the middle of reading Melanie Blaikie’s book called ‘Teach What You Do’- it’s a great book as it has loads of advise on how to run your own workshop, whatever it is you do I found it to be really helpful and I’d recommend giving it a read. 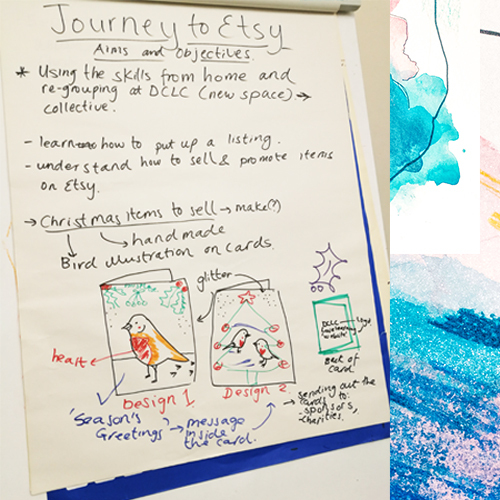 I really enjoyed myself and I look forward to what DCLC do in the future; whether it’s using Etsy for their shop or simply setting up a page on their website I can’t wait to see what happens! All the best DCLC!